Passage Croatian motorways is charged not by vignettes, but with the use of toll gates where tolls are collected in Croatia. The toll system and without having to purchase special electronic equipment can be used by vehicles weighing over 3.5 tons. For vehicles using paid motorway sections, there are 5 weight categories, you start at the ends of motorcycles and commercial vehicles with a trailer and TIR. Those who, after the Croatian motorways pass more often, they can use the prepaid coupons with monthly and annual validity of any electronic toll system ETC. Links to pricelist, maps toll motorway sections and additional information can be found below. 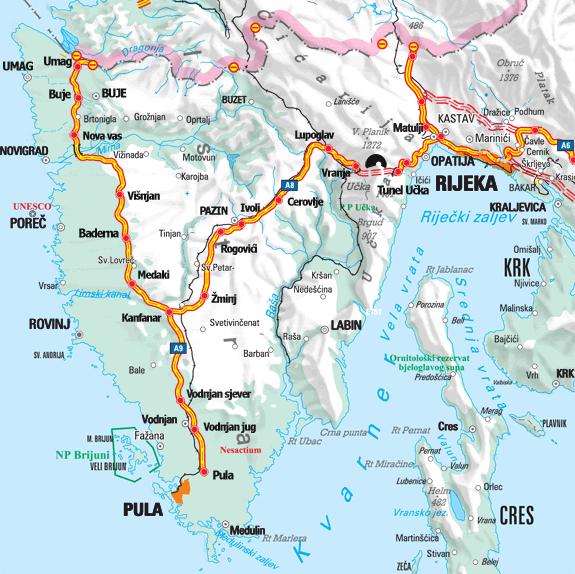 If you are going to pass across the Istrian Peninsula, then unfortunately there are also some tolled sections. The toll roads and charging for passage on the Istrian peninsula old company Bina Istra. Map with drawing of toll sections, including an interactive prices calculator you can find on Bina-Istra.com. For those who frequently travel to Croatia, several options to reduce tolls Croatia, to simplify payment for passage of individual toll gates. There is either a fixed fee prepaid card with monthly and annual validity. For more information please visit hac.hr. In Croatia, for relief from the payment of tolls is necessary to possess Croatian Smart card (not enough ZTP). These concessions are granted, however, only after approval of the application to which the addition to the official confirmation of disability should be provided a copy of a technical and an identity card. Smart card will be issued only for those with more than 80% disability of lower limbs and war invalids. Detailed information for applicants on the Smart Card, including contact numbers and addresses to which the application may be submitted in person or by mail visitexemption payment for passage highways. ETC toll system (ENC) is a wireless device allowing easy filing and payment for passage of most paid road sections in Croatia. ETC system can not be used to pay for transit toll on the Istrian peninsula, the company operates Bina Istra see. above. ETC system is particularly suitable for those who crossed the Croatian toll roads more often. For more information, including a breakdown of payment options, installation guide, and access to the online system available in the official ETC web Croatian motorways.